This set of images shows 4 ways to add individuality to your favorite look. First style it with a little extra puffy volume at the front and back, or add pretty circlet braids at the sides. A braided headband is another fashionable detail that’s easy to add. And the flat braid above the fastener in the large right-hand image also adds an attractive twist! And the muted copper hair color is very trendy right now, too! In the trendy 1960’s real-hair, hair-pieces were worn by all young women for evening wear! They were easily attached via a small comb at the crown and had built-in crown height as show above. 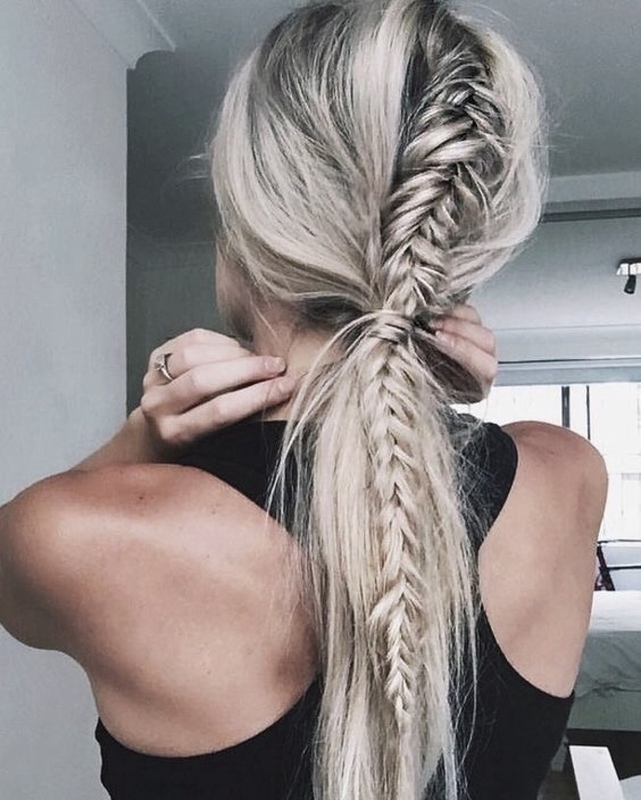 The braid adds texture and covers the join between your hair and the hair-piece. This image shows an authentic vintage ponytail hairstyle – complete with false eyelashes, brown and white eye-shadow and trendy, dangly earrings! 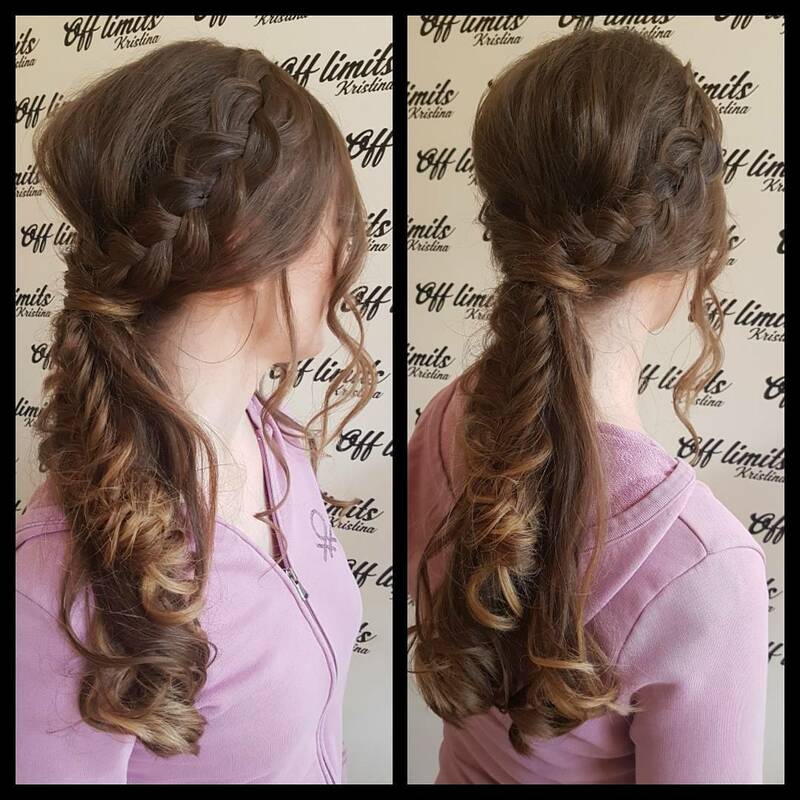 This lovely look shows how a talented stylist can transform long hair into a beautiful, semi-formal ponytail for a special event. The trendy flat, wide braid adds pretty texture along the sides, especially on fine hair. The low-set ponytail combines lovely fish-tail braiding with casual, loose curled sections. Gentle highlighting accentuates the details in a gorgeous style for a young woman or girl attending a wedding or party! 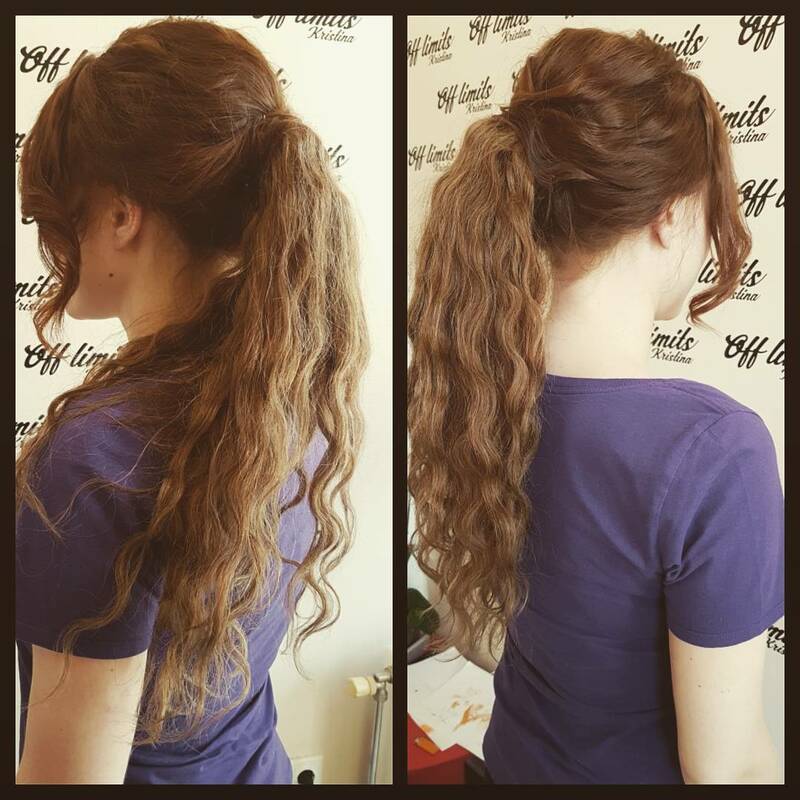 This pretty, wavy ponytail is a teen ‘party look’ that’s special, but casual enough to be comfortable to wear. There’s a little extra height at the crown for a touch of sophistication and attractive texture from looped sections. A centre-part allows loose ringlet strands to frame the face at the front and rippling waves complete this cute, party ponytail idea! Long hair in the latest beige-blonde shades is always an eye-catching and ‘expensive’ look! So the artful messy finish cannot disguise that this is definitely a ‘posh’ ponytail. Loosely looped sides and playful bubble puffs show off the beautiful colors in a sophisticated, casual ponytail. 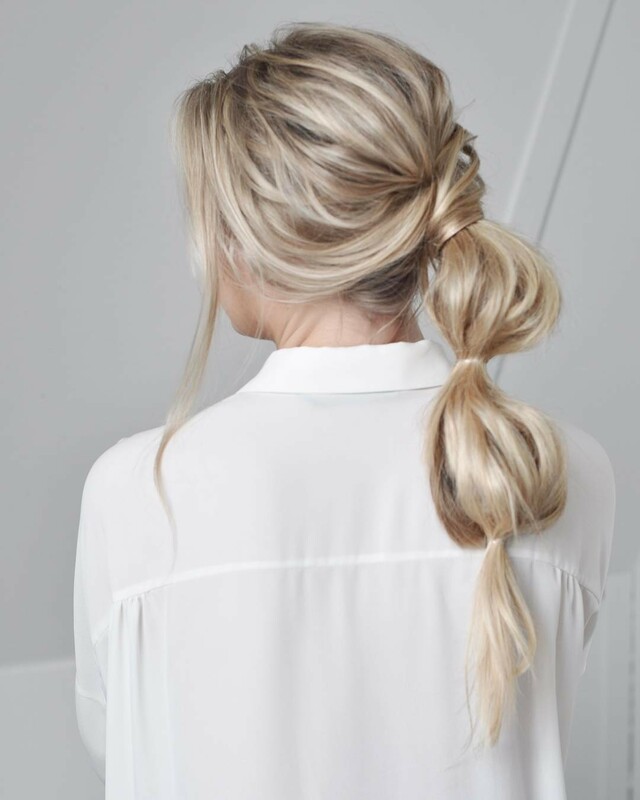 This ponytail pretends to be a casual everyday look, but it’s also a gorgeous, high maintenance hairstyle! 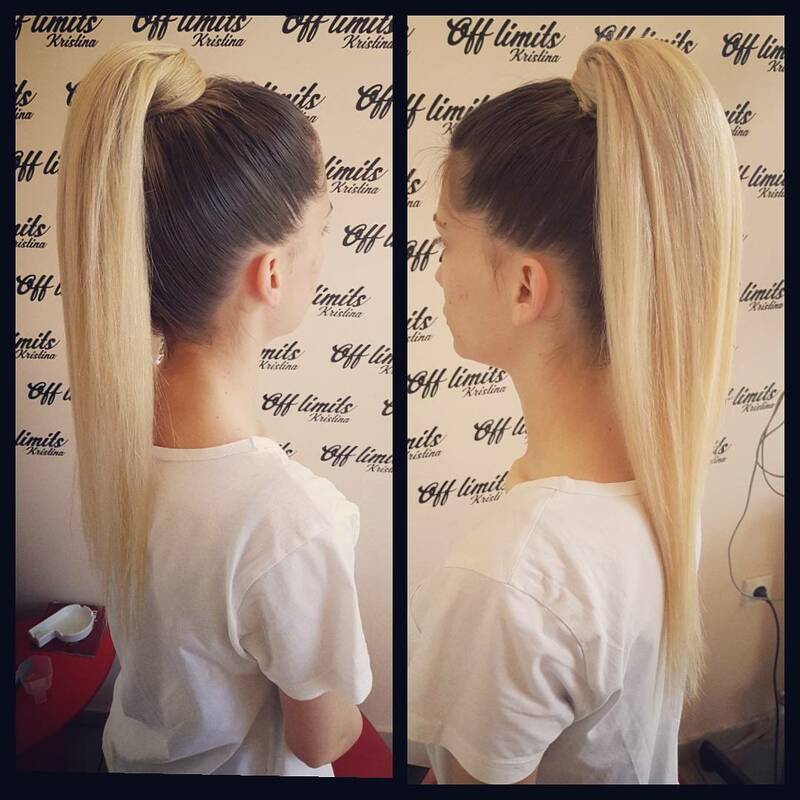 This classic high ponytail is a great way to transform your everyday pony into a more formal style for a prom or party! Adding height at the crown always creates an extra touch of style and the eye-catching beige-blonde ombré makes a stunning ponytail! There’s a nice contrast between dark-blonde hair around the head and the brightly colored pony. This minimalist style shows how to ramp up the impact with strong, simple lines and fabulous hair colors! 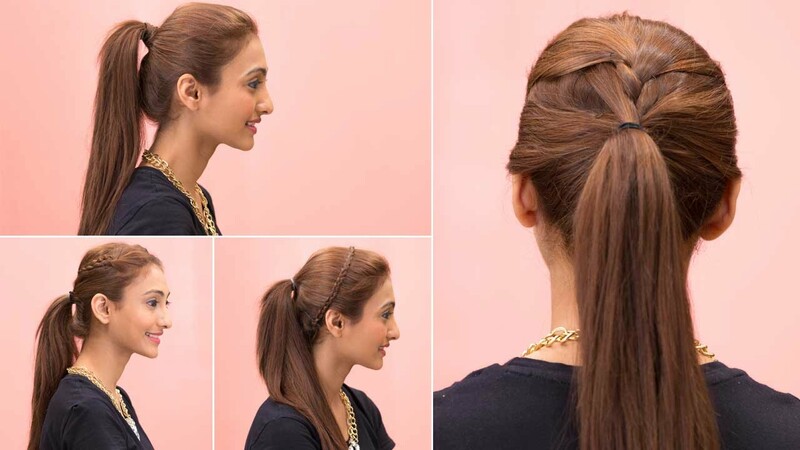 Here’s a lavish ponytail hairstyle suitable for evening wear and glitzy parties. It’s color design is clever and original using blonde on coffee-brown to create a lovely 3-D highlight on trendy head braids. The back is a gorgeous, full-volumed ponytail in warm beige cascading down loosely in contrast to the neat braids. It’s a real show-stopper with urban-chic ‘nose-rings’ decorating one side! This is urban hair-styling offering an edgier image, with a harsh contrast between black roots and all-over blonde. Nevertheless, this is a high-fashion ash-blonde shade that creates beautiful 3-D patterns in the fish-tail head braid! The braid starts at the crown and continues as a tapered detail in the messy ponytail below. It’s a strong and original look! And if you love Boho style, this is a great hair color idea to try on your ponytail hairstyles! Soft copper balayage makes delightful patterns in the head braids before cascading from the high ponytail. The pony is also a highly contemporary color design of warm copper- and cool ash-blonde. This trend-setting style is full of style and color contrasts that add up to a fabulous new look! Here’s a cute new idea with a relaxed, hippy vibe that’s perfect for summer holidays and teen parties! Adding matching or mis-matched colored cord to your ponytail hairstyles is a cheap and simple ponytail idea you can do at home. 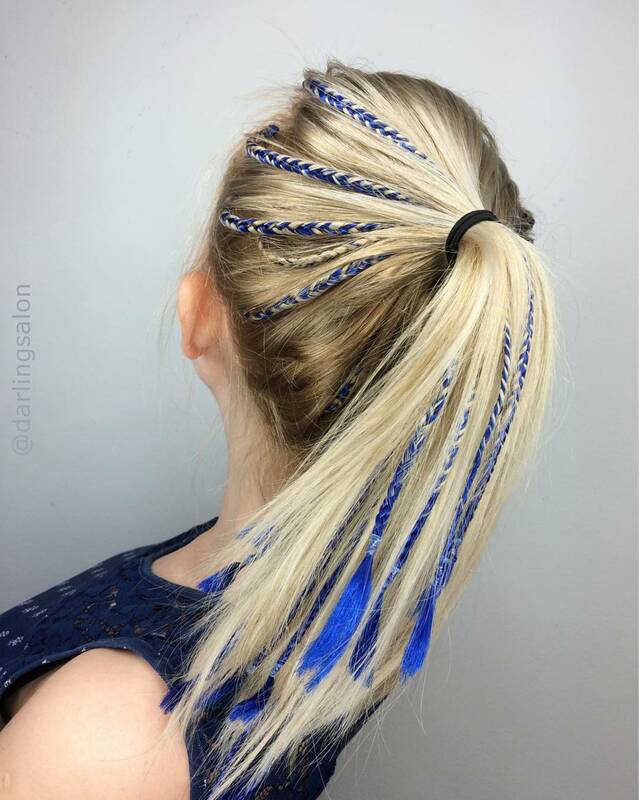 This royal blue shade creates adorable patterns in the model’s bright blonde pony. Whatever hair color you have can be livened up with a few head braids in your favorite colored cord!